Is poor cylinder performance interfering with the reliable operation of your hydraulic system? Do you feel like your business is bleeding money as a result? At Bernell Hydraulics, we feel your pain. We are here to help you figure out a solution that will put an end to unreliable, failure-prone equipment. Often, cylinder problems are caused by having the wrong product for the job. Maybe the material is too weak or maybe the walls of the cylinder are too thin. You can rely on the pros at Bernell Hydraulics to help troubleshoot your system, check your specs, and make sure you get Oilgear hydraulic cylinders in Los Angeles CA that can meet the challenge. Rigorous Quality Control: Oilgear’s cylinder division has an ISO quality system that is ruthless is keeping non-conforming products from the market. The company’s on-site testing capabilities accommodate cylinders up to 30 inches across and 64 feet long extended. Serious Performance: A common theme at Oilgear is the ability for their products to deliver superior performance and durability even in demanding conditions. Oilgear hydraulic cylinders in Los Angeles CA are no exception. When you’re talking about big cylinders that will be doing a big job, you do not want to accept any imitations. At Bernell Hydraulics, we never sell any knock off parts. 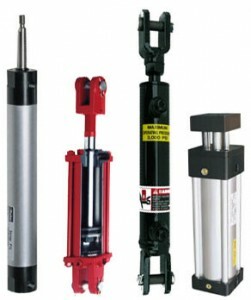 You can rely on your Oilgear hydraulic cylinders in Los Angeles CA to be the real deal when you buy from us. Typically, Oilgear cylinders are so specialized they end up needing to be housed in a custom system. Bernell Hydraulics can provide all the support you need in this area thanks to our custom design and fabrication services. If you would like more information about our company or about Oilgear hydraulic cylinders in Los Angeles CA, please contact us at 800-326-7252.